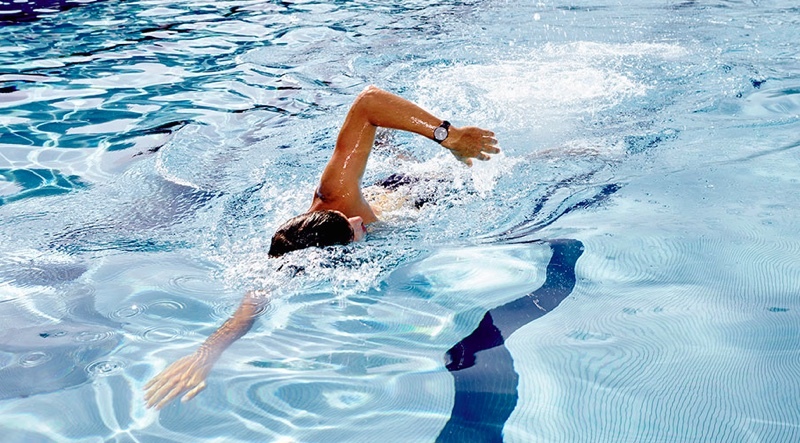 Withings' Activité and Activité Pop are two of only a handful of activity trackers on the market that are entirely waterproof, and as of today, the two devices are able to be used to track swimming. Swim detection is a feature that Withings has long promised and will be a welcome addition for customers who bought the activity trackers to track their swim movements. Following today's firmware update, Activité fitness trackers will be able to automatically detect swim motions, recording a swimming session as a workout as the device does for other activities like running. Activity and workout information is then available for viewing within the accompanying Withings Health Mate app. Activité Pop automatically recognizes swim. Just put it on, dive in and the watch will log your full session and record calories burned. Both of the Withings activity trackers are water resistant down to 50 meters, or 164 feet, a feature that many of the popular activity trackers on the market cannot match. Even Apple's own Apple Watch is not rated for swimming, but several people have opted to test the waterproofing of the device and have found that it does seem to be able to be used in the water with no consequence. Still, Apple does not recommend that it be used when swimming or showering, unlike the Activité, which can be used reliably in both situations. Withings' Activité and Activité Pop can be purchased from the Withings website for $450 and $149.95, respectively. There are quite a few smartwatch products for swimming: Garmin fenix 3, 920xt etc. I'll be surprised if Apple do not waterproof their watch within the next 2 generations, they can easily steal the health tracking market they just need the waterproofing, 48+ hour battery (sleep tracking), multisport app and GPS built in. I was going to rant and complain about how Apple purposely leaves features out in order to have a selling point for future versions. Which lee know they do to a certain extent, but in reality, they had to leave GPS out of their watch to moderate battery usage. But Apple has painted itself in a corner by positioning the watch as a piece of jewelry rather than tough activity device. This direction probably started with Ive who seems more comfortable on the fashion floor than a hiking trail or pool. Ive's increased control (without Jobs or Forestall to balance) is not helpful for the user. But I don't think Tim sees this. In fact I'm not sure anyone at Apple is putting the end user at the top of the list anymore. I'm not sure what you're talking about. Did you read my post where I said it was unusable? I went back to a regular Watch until I bought an Apple watch a few weeks ago. Apologies, I read all posts but on mobile it's easy to scroll past usernames and I thought your earlier post was by a different person. I bought an Activité Pop from Best Buy in January, with moderate expectations. It was just going to be something to hold me off until the Apple Watch release. Even if it looked rather unattractive and cheap, at least it would do the job: tell time and track activity. Right? Unfortunately, no. I was hugely let down by the product and Withings support. I quickly realized I had to recalibrate the watch multiple times a day because it would regularly go off by 30+ minutes for no reason, rendering it useless. I contacted support a few times and all they gave me was promises of a fix in some future update sometime. The watch was useless—I couldn't trust it to tell the correct time, so it could not function as a watch. And if it couldn't even do that then I certainly wasn't going to trust it to be able to accurately count steps. I own a Withings bluetooth scale which is great, but making a decent "smart" watch isn't as easy as some companies seem to think. Apple took three years to make a watch, while these companies think they can throw something together in as many months. I truly feel sorry for anyone who has spent $450 for the non-pop model of this rushed to market beta product. I also had issues with it disconnecting from my phone and not updating properly. A problem I've never had with the Apple Watch. I don't mean to sound like a fanboy but if you want a good smartwatch for iOS you only have one option. If you were thinking of buying this over the Apple Watch: don't. If you're on a budget just get a fitbit and a regular watch. I bought their baby monitor a couple years ago. Huge let down. This is why opinions are great - I completely don't share yours. What you wrote would be apt for the Withings Activité from the article - I really wouldn't want to wear something as delicate looking whilst swimming (the leather strap is not something I'd want in a swimming pool) or at the gym. I feel as though I must correct some misinformation here. The Withings is cheaper and designed for swimming, it is hardly delicate. I would not want to go swimming with an Apple watch for fear of it breaking and voiding the warranty. This product is designed for swimming. For you to say you wouldn't want to swim with it because it looks delicate is, IMO, madness. Secondly, of course you don't wear the leather strap when you go swimming or to the gym. That's why the straps are interchangeable, and a damn sight cheaper than Apple's straps. You wear a silicone one for swimming. It says all this on their website should you bother to look. It took them more than half a year to implement the swim tracking capability, a feature which was advertised on the watch's page from the beginning. I guess that for a $450 watch, coming soon means waiting more than 6 month. This is truly sad, because i really wanted to buy one. The first part of your comment is true however do bear in mind that the watch is only $149 if you don't go for the expensive looking one, and why would you? I can only imagine that this is because you have found a replacement. Otherwise it simply doesn't make sense to me unless you are not the sort of person to use wearable technology in the first place. If you don't have an alternative, why on earth would you just not use the one that you have bought? I usually defend Apple when I post, and I agree Withings have been late on this update, but there is some misinformation here that I felt I had to correct. And it's a damn shame Apple with its bazillion dollars of cash is afraid of a few people claiming warranty on their watch because it broke while swimming. It seems perfectly waterproof and I would buy one easily if it did swimming tracking as well.